I Love You Messages for Mom: Why wait for Mother’s Day or birthdays to tell your mum how much you love her? Do yourself a favor and don’t depend on cheesy quotes and greeting cards that start with Dear Mom and end with the most boring one-liners. Make it personal and dig deep in your heart to think of something sweet you have to say to the woman who has made unimaginable sacrifices in her own life to infuse happiness in yours. Think of all the cute memories, hugs and the funny moments that have brought the family together. Pen down your thoughts on a note or put them up on Facebook, Pinterest, Twitter and Instagram where everyone can see. Show her that you may have been a rebel but in your heart you’re still a son or a daughter who loves her now and forever. 6) I may never be able to be exactly like you, but just the thought of filling the shoes of a woman like you makes me a better person. I love you mom. 7) The world would change into a better place if producers started making reality TV shows about how loving moms like you juggle the burdensome responsibilities of work, family and kids – all while carrying a beautiful smile on the face. I love you ma. 8) I am not afraid of dying because I have already been to heaven – the warm place where I rest my head on my mother’s shoulder. I love you mom. 9) Mom – your love is the chicken soup for my soul. I love you. 10) I fight with you every now and then, I keep arguing again and again. But deep down inside I hope that your heart knows, that my love for you will forever grow. I love you ma. 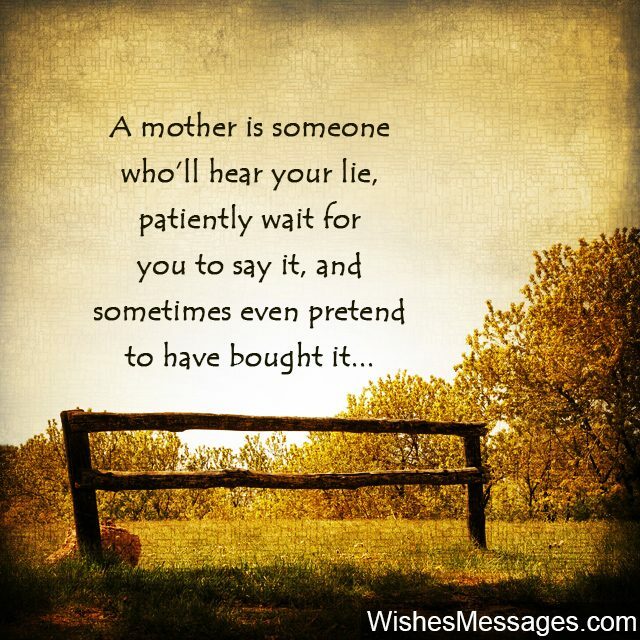 11) A mother is someone who’ll hear your lie, patiently wait for you to say it and sometimes even pretend to have bought it. Thanks for bearing with me mom. 12) I will never be able to describe in words what my mom means to me. If anyone wants to know, they will have to go inside my heart to see. My mom’s love is warm, cute, caring and sweet – it is all that my heart needs to beat. I love you. 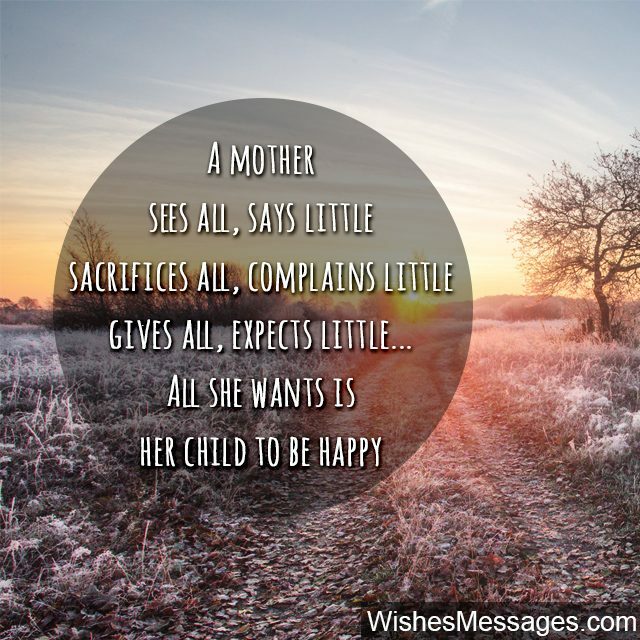 13) A mother’s love gives to a child, what schools and colleges cannot. Love you mom. 14) My life has been tolerable, livable and enjoyable even after you and dad got divorced – all thanks to a heroic single mom like you. I love you. 15) I may call you mom but my heart calls you bestie. Your love makes every day of my life happy and carefree. I love you. 16) Mom, I know that behind those soft and comforting hugs lies a woman whose heart is strong and soul is selfless. I love you. 17) I don’t always agree with you. I don’t always be nice to you. I don’t always like you. I don’t always hug you. But I want you to remember… deep down in my heart I always love you, and forever will. Thanks for everything mom. 18) Dear mom, our House is a Home, only because of You. I love you. 19) MOM is just another name for the super glue that holds a family together. I love you mom. 20) When God gives the world a mother like you, it is His way of saying that the world needs lots more love, care and affection. I have been lucky to be your son. I love you mom. 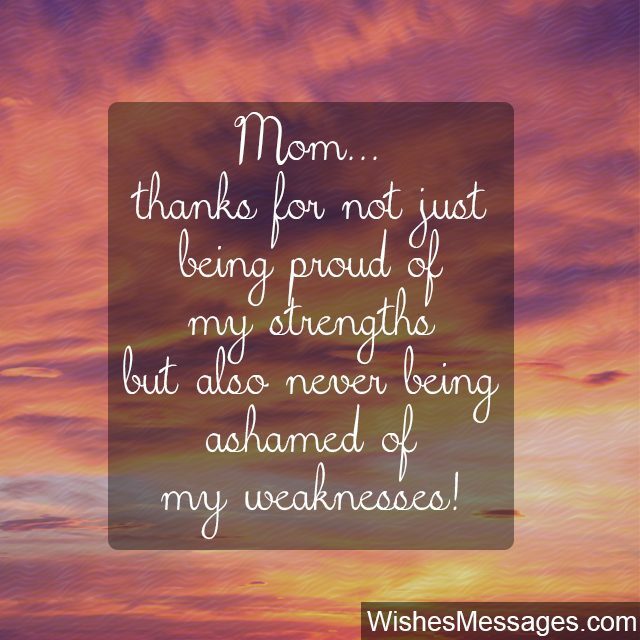 21) Mom, thanks for not just being proud of my strengths but also never being ashamed of my weaknesses. Love ya. 22) A real mother is a person who could complain about the sacrifices she makes to raise a family, but chooses to think about the happiness she gains from raising one. Just like you! 23) Mom… the bond between both of us, is more than just marvelous. As a mother you are fantastic, the warmth of your love is just magic. I love you. 24) My relationship with my mother has no give and take, simply ‘coz there is nothing about our bond that is fake. I love you mom. 25) I will never know what it means to live a life void of love – because my mother’s has never let me feel that way. I love you mom. 26) Throughout my teenage years I have been the epitome of a rebel. My behavior and actions were under peer pressure’s spell. 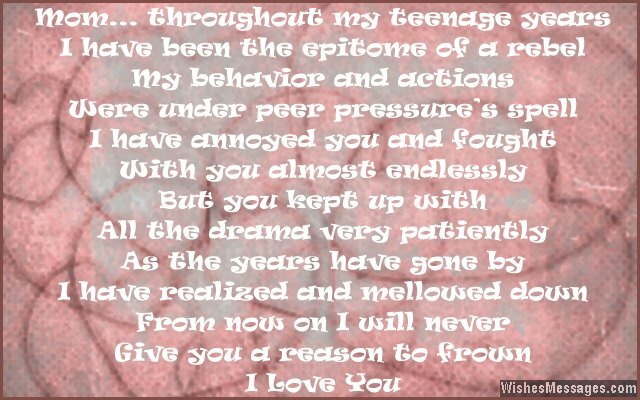 I have annoyed you and fought with you almost endlessly. But you kept up with all the drama very patiently. As the years have gone by I have realized and mellowed down. From now on I will never give you a reason to frown. I love you. 27) It takes a girl to fall in love, a woman to get married, a mom to give birth but a mother to lovingly raise a child. I love you, dear mother. 28) Anyone can take responsibility for a child’s achievements. But only a good mother takes responsibility for her children’s failures too. Thanks for being there for me mom. 29) A mother’s love may be soft, tender and beautiful. But we all know that it needs a woman with a hard, rugged and indestructible spine to give her children everything that they deserve. I love you mom. 30) To the Queen of this home, the Queen of my daddy’s heart and the Queen of my life – I love you. 31) My view of life has always had a filter of the mellowest and the warmest hues. All because I was raised by a mother as wonderful as you. I love you. 32) The absence of a father figure in my life was more than made up by the presence of a larger than life mother figure. I love you mom, thanks for everything. 33) I love you mom – not just because you are my mother, but because there is no one else in the world who understands me better. 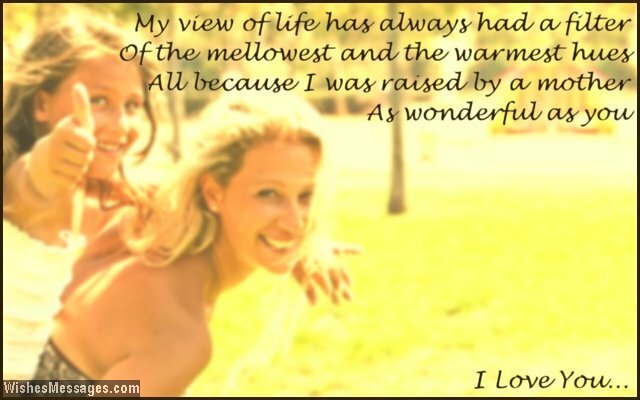 34) Dear mom, you have always pushed me to be my best, and your support has always put all my worries to rest. I love you. 35) I know I am going to be a successful professional, beautiful woman and a wonderful mother when I grow up – because I have your genes. I love you mom. 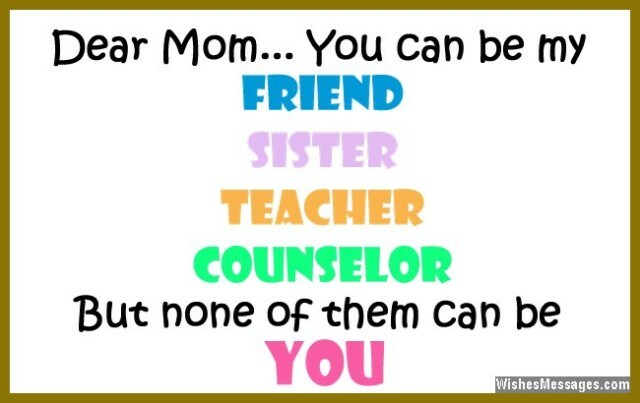 36) Dear mom, you can be my friend, sister, teacher and counselor. But none of them can be you. I love you. 37) Just like Comfort Food and Comfort Clothing, if there was a term called Comfort Person, in my life it would be you. Love you ma. 38) If my life was a skyscraper, you would be its architect, builder and most importantly the founding pillars. I love you ma. 39) I did not understand the importance of my mom’s hand holding my finger when I was small. But now I know that she was actually guiding me in the right direction till I became tall. I love you mom. 40) Dear mom, I don’t know what I can do, to say thank you. You pushed me to be successful and made my life wonderful. Let me just start by saying, I love you.